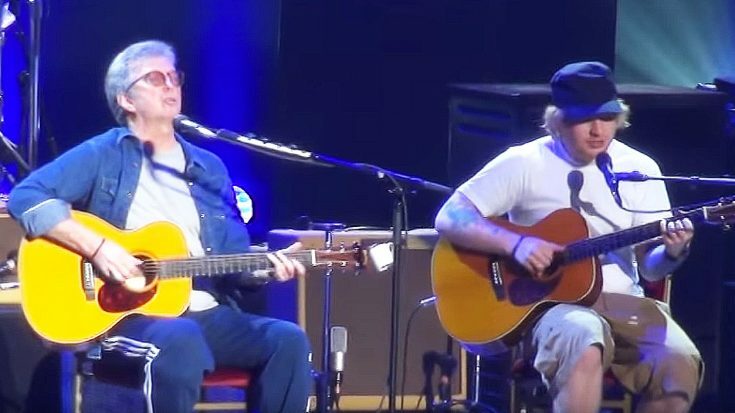 Ed Sheeran Joins Eric Clapton For An Epic Performance Of “I Will Be There” – Wow! What more is there to say about Eric Clapton? He is literally one of the most iconic and influential guitarists of all time and he is beloved by so many fans from all over the world. Being one of the most decorated and respected musicians of all time, Eric Clapton is the living personification of success. He is one of the best, pure and simple. It goes without saying that if Eric Clapton comes through to your town, you should go and see one of his live shows because it will be amazing. Not just because it’s Eric Clapton and he’s awesome, but also because you never know when he’ll bring out the occasional surprise guest. Like the time he rolled through Japan and brought a very special friend on stage with him! What you’re about to watch is a video in which the aforementioned Eric Clapton takes to the stage to perform “I Will Be There”, but with a twist. He brings the iconic Ed Sheeran on stage with him. See for yourself!